Mad Freebording is now officialy featured in the Windows gallery on Unity's site! Thanks to Microsoft and Unity! I can't wait to get my next game Mad Snowboarding featured there too ;). Stay tuned for the Mad Snowboarding demo, it will be released in a few weeks! Freebord The Game now available in Windows Store! Finally Freebord The Game made it to the Windows Store and can now be played offline on Windows desktop PCs and also on Windows Tablets! Half of the game is available for free completely without ads. The other 8 levels can be played in the full version of the game that can be purchased for a few dollars. Freebord The Game patch on Android! 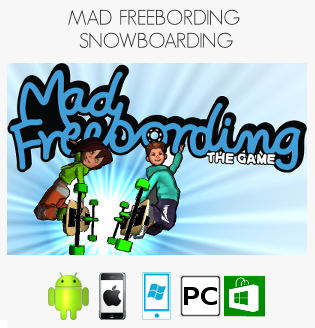 It took a long while, but now Mad Freebording is finaly available on Windows Phone! Here I want to thank Microsoft for their Windows Phone & Windows offer for Unity! I did not only receive a Nokia Lumia 925 device for testing purposes FOR FREE, but they tested my stuff and gave me feedback. I advise every Unity game developer to submit an entry to them (just Google it)!